We have the second spoiler for the March BoxyLuxe box! I do not subscribe to Boxyluxe to receive Morphe. That is not Luxe to me. thats because the products will be more expensive….. I know we are all different tones, colors and types, but I find that overall Boxycharm(or Luxe) is great! Sure there are some products that I give to a friend or women’s shelter, but so what? The value gained in these boxes is simply spectacular…not to mention how many times the items push me to try colors and products that I wouldn’t normally go to. I say Hooray for this sub…it makes my month! I really hope i get the Brunch Baby Palette! I finally walked away after so many neutral toned palettes again. This is just so tired and boring. I agree with all of the many comments about boring and bland neutral palettes in beige-brown. In the previews, some of the palettes look colorful and interesting, but I seldom seem to get them — although I should more often if boxes are sent randomly. Boxy is in desperate need of tailoring items to the preferences of their customers. The lux Ipsy box has been doing a great job so have some of the smaller cosmetic box subscriptions like Sephora’s Play. Damn that Laura Lee palette for putting such a bad taste in everyone’s mouth for bold colors – now we’re stuck with boring neutrals month after month! I agree. I want one like the alamar palette. I mean how many shades of brown do you need. I hope the Alamar Cosmetics Reina del Caribe Vol. 2 ends up in Boxycharm sometime this year. The first one is so good. That is unfortunate, but I think of this box as a box for makeup enthusiasts. If all you can wear is neutrals why do you even want a subscription box? Making a singles eyeshadow palette or buying a few key palettes should be enough for your needs. That isn’t meant to be critical but it would be like signing up for a a sub box that was for heels when all you wear is flats and work clogs and asking for non slip shoes in the box. Yes, you can be enthusiastic about neutrals but I don’t think most people want a plethora of neutral palettes from sub boxes. What am I going to do with all these palettes full of browns, taupes, and oranges? I’d love some vibrant colors with less fall out. My subscription renews in April; I have a feeling that March will be my last. I love it cosmetics! Please send us some brushes!!! I think its disgusting that boxycharm would partner with Morphe after all of their scandals. I ditched regular Boxy and Luxe. Didn’t appreciate the button confirming my decision to unsubscribe Luxe reading “No I hate luxury products”. That’s so petty. I have not been overly excited by Boxy at all, so I’ll put the $21 to other uses. To each their own tho, I suppose. People these days are so silly. That’s ridiculous….also kinda inaccurate as this month’s box so far doesn’t have one product I’d consider “luxury.” I’ll give it another month, but I may be pushing that button soon too (and that button would leave me not wanting to come back, truth be told). the it cream is pretty luxe for me. I consider brands sold at sephora luxury- they really only carry higher end products. a $48 cream by a great brand is luxe to me. These repackaged chinese eyeshadow palettes are not luxe. These palettes are the same that you can get for $10 on amazon. Go to the Boxycharm site and click on “my account”. On the left will be a button that lets you adjust your account. The “unsubscribe” button should be there. I’ve never signed up for Boxy, largely due to the way they treat their customers and their “don’t give a crap” attitude. Just wanted to say thanks for giving me yet another reason to never cave in on that stance. Unbelievable that they did that! Smh…sorry Boxy, you’re not so charming. Wooow, that’s like the pages that pop up on websites that say “SAVE 20% ON YOUR NEXT ORDER”. And then if you click ‘no thanks’ there’s usually a sarcastic phrase like ‘No Thanks, I like paying full price.’ Sometimes I just don’t wanna put my email in! Because then they send you a (almost 100% of the time) time-sensitive coupon that expires in like, 7 days or less. They’re definitely declining into safe choices, repetitive brands, and flatters-everyone-because-it’s-bland-shades. News Flash: just because it’s neutral doesn’t mean it flatters everyone. It usually means half your customers are disappointed with the “neutral-aka-makes-me-look-dead-and/or-sickly” colors. A quarter are in the “flatters-me” category. And the other quarter are wanting bolder, bright, textured, or special effects out-of-the-box type palettes. 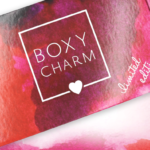 I wish I’d joined Boxy Charm back when they were competing hard-core with GlossyBox. That kept things getting better in BC, not so much with GB. And I canceled GB when they “accidentally” canceled my $17. (Some odd cents here)-rate-for-life-locked-in sub. Started getting billed full price (Which was already at the point where it wasn’t worth full-price.) I called and they said they couldn’t do anything to get it back, because my payment method expired and lapsed. & thus the start of my Sub-Box-Detox began. I’m enjoying Ipsy Plus so much more. Better and newer brands and products and while not perfect, they do seem to be using our profiles and reviews to customize, something Boxy has been promising for a long time. I know some people only want “wearable work colors” i.e. brown all the time every time, but palettes full of nothing but brown are for me like losing the Boxycharm lottery. I am so sick and tired of brown and orange liquid lips. Makes me look dead! I agree. Variations of brown and orange are not desirable and tiresome. I agree. Enough of the bland beige-brown palettes. That’s why Boxy is in desperate need to take into account the preferences of its customers. This is great! I’m so excited for the it confidence in a cream product. I’ve wanted to try it for a while, now I’ll get the full size in my boxyluxe. Great job boxycharm keep up the good work. I’ve sampled it. It’s very nice, you should be pleased with it. I just bought the It cosmetics confidence in a cleanser and confidence in an eye cream from Ultas skin care sale, so this will go nicely with both of them!! Yayyyyy! I think I’ll wait to use the ones I bought until I get this cream so I can see what then benefits are from the whole line. Excited for both spoilers so far. I enjoy palettes that are good quality , irregardless of the price tag. I’m happy boxy has been trying different brands in the boxes. Some of those Pur palettes had higher price tags and didnt work out so well. That’s true… the Pur palettes were, overall, not great. Same with that atrocious Pretty Vulgar palette. Not only was it a hot mess to look at (mine arrived damaged, with pans in weird positions) it wasn’t even good quality. Is the Elemis we got a daily moisturizer? I am about to run out of Clinique and it will be BEFORE mid March! I’m going to give away the Morphe palette since I don’t need another palette unless it’s really unique. It will bring others more joy than me. I am keeping the moisturizer!!! It will save me $30ish lol. Yes! It is a daily moisturizer! I really like both spoilers so far! And the Elemis from December is amazing! Yes thanks for letting us know about the kit – I just ordered one for the Marine cream – great deal! Wow!! Thanks for that tip. I love the Elemis from Dec boxy but, sadly I can’t afford the price tag so, this tip is very much appreciated!! @blondie1021 Thank you so much for the Ulta tip! Elemis has free sample kits on their website every few months. I love their cleansing balm, so I make my family members get kits delivered to them for me to take! If you get FFF, Elemis is a hot brand for their add-on sales. I got a full size three piece set of an eye cream, night oil, and flower mask for $29. If I end up with the really warm brown palette when I have a fairest shade of pale cool complexion. I’m really hoping they keep my profile in mind with selection. Let’s hope BoxyLuxe can keep up with IpsyLuxe! Boxycharm doesn’t use the profile information for any customization. Ipsy plus personalization seems to be getting better. I’ve also noticed the Ipsy Plus customization getting better. I’ve been getting a survey after every box asking for my opinion. I believe they want to perfect the process before they let anyone else sign up. I appreciate it because every month so far the box is getting better and better. I keep getting their boring beige-brown palettes and can’t use them. It’s very disappointing. They need to personalize, and I agree that Ipsy has greatly improved its personalization with its luxe box. So I just dumped BoxyLuxe, Macy’s and Sephora all in one day. I am on product overload and I just don’t need another palette. I was so bummed with January’s box because I received the same Tarte palette I already had. Plus I figured I wouldn’t get the one Morphe palette I wanted. 🤷🏻‍♀️ I might still drop regular Boxy but I haven’t been able to pull the trigger yet. Congratulations! won’t miss any of them, I can promise you that. Good job! You’ve inspired me. I’ve been needing to cancel my subscription, but FOMO strikes. However, I do honestly have enough products. So, I’ve just been to their site & canceled. I feel a little better already. Thanks! Ugh, I am striking out on skincare with Boxy. This, along with the Elemis from December luxe and the Tatcha masks all have silicone in them, such a bummer! I avoid silicones in my skin care since it causes me to break out in milia. Love seeing nice skin care in the boxes but the particular products just don’t work for me personally. Might be skipping the luxe in March, not a fan of Morphe so nothing too enticing yet! That Elemis was impossible to use, so much perfume. Don’t care how much it’s worth. Ugh. I’m sorry it didn’t work out for you. I would like to buy it off you if you still have it? Evelyn I do still have it, if you’re interested leave your email and I’ll get ahold of you! If Evelyn doesn’t want it I am interested in it. Let me know, thank you! I love that cream and am running low already. I need to find someone to buy it off! I have an Elemis peel if you’re interested in buying it! Michelle, other than dimethicone, can you share what other silicone are in this cream? I am curious. I know its not clean, like Earthwise, but still want to try since i did get it. It has done wonders for my friend and if it doesn’t work, she can’t wait to grab it. I know some people have complained that African Botanics serum is too fragrant. I I hope skin care products stop using fragrances unless they have an actual benefit (rose). I know you can have millia expressed at a dermatologist but a cheaper trick can be using Pixie toner and a q tip just on that milia, it took awhile but finally got rid of my under eye milia .. Good luck. Tanya, thank you so much for the Pixie toner tip! I have just one white bump that has been driving me crazy, and the Pixie toner is up next in my stash. Perfect timing! Michelle, Glad you know what works for you and milia is the worse. I do find exfoliating (josh Rosebrook exfoliating activator) and the peels help. Clean organic mositerizers and serum do a better job for me. But my friend, who was heading toward Barbara Bush (no disrespect) face, has had amazing results!! Of course, we are different people with different skin. I also find because I layer so much I only need a small amount of mosterizer on outer face. We’ll see and I promise to report back as Elemis is way on the back burner. These 11s are UGH!! Judi, hope that works for you. It took about six weeks and then one day. I noticed gone. I give a lot of the makeup away as I have more than enough neutrals, and very rarely get wearable (for me) colors. I actually wanted the VV palette from December, but gave it to my daughter for Christmas. I keep a stockpile of skin care as I go through a lot, but it is easy to get on overload, especially if you subscribe to numerous boxes. When it gets to be too much I go through it and give it to family and friends, they are always pleased to get them, and I don’t feel so guilty over the quantity I have on hand. My philosophy is that there is no such thing as too many palettes. I have a drawer in my dresser for my palettes (I just did a huge destash on Poshmark), and I have several acrylic organizers (Amazon… It’ll change your life) boxes from scripts for things like hair care or makeup I’m not using right then and may or may not be next. Then I have 2 boxes, one for back ups of what I’m currently using or a brand that’s new to me and all the rest goes in the bigger box. I sell a lot, gift a lot and donate a lot. Organizers are the way to go. I have a 2-tired one that spins I put most of myskin care in and the samples for on top in the lipstick holes. They keep this up and I won’t have any problems cancelling. I’m excited for both! From what I seen the eye shadows are creamy which is a huge plus for me! I never tried the face cream from IT Cosmetics however, I did look up the ingredients and it does have strong essential oils & fragrances for those who have sensitive skin. it also contains coconut oil & shea butter which can potentially block pores! It is alcohol free which is a huge plus! This honestly has more good benefits than the bad ones (moisturizing benefits) . Cant wait to try it! Omg I love confidence in a cream I have the full size from IT. I use it as My night time moisturizer. And switch between. Muard and Elemis for day time. I am so happy I don’t have to buy another everything else in the box is just extra for me now! I never tried the IT cosmetics creme… so I’m excited to see how it works on my skin…. I’m glad that Yosef is adding more skincare to the boxes because it is very important to maintain your skin and keep it feeling your best…. I wonder if this will be full size? Their website shows 60ml ($48) and 15ml ($16). I find that BoxyCharm considers anything available for retail sale “Full Size” even if it’s really just the travel Size lol. The video of the spoiler says that it costs $48, and based on the fact the Elemis was a full size item in December I’m fairly certain it’ll be the full size. I hope BC gives us option to choose the palette, just like they give us option to choose between flat iron and pallet. Excited to try the cream. The box is shaping up nicely. I love getting skin care, looking forward to trying this one as it is new to me. Okay, the IT hooked me. Me too. I wasn’t thrilled about Morphe – I just have a lot of eyeshadow and I don’t hear great things outside of people with commission. But I LOVE It Cosmetics!! Don’t worry about “get the September box”. MSA often copy and paste general language without proofreading (sorry Liz, no offence). You will get off waitlist at the time of billing, which is beginning of March. BC does not take people off in mid month, only at the time of billing. Don’t worry, you will be off the list. How did you get off the waiting list on ipsy GBP?? I was on it a couple months before I got the email. I did email CS to inquire on wait-time, and I was off the waitlist within a week. Am I the only one who thinks purples don’t go with brown? I would love the purples, plums, pinks of these 4 palettes combined into one; without the browns and beiges. …So about 25% of each one works for me. Meh. Glad I have those zpalletes to fill, so I can make my own mix of the right colors. My thoughts are It depends on your skin tone and complexion. They can go together beautifully as any colors can. I’m not as adept at blending but I have seen some amazing looks wirh interesting color combinations. I always wear a brown / tan transition shade and often wear purple or maybe. It looks great with hazel eyes. Brown definitely goes with pink or purple you just have to be careful with the undetones. I also only wear brown eyeliner and it always looks good. That’s exactly how I feel. I rarely even wear browns. I wear cranberries, purples, greens and blues. I have tons of useless palettes. I’ve been destashing. Confidence in a Cream is so amazing! I am so excited to get another one! I’ll be happy with any of those palettes. They all have a good mix of tones and shades. A little hesitant about quality based on other posts but I’m always happy to try a brand I haven’t tried yet and it makes me really happy to see new brands in BC repitoire. I won’t use the cream but I’m still loving my Elemis and that’s a great cream to give my daughter. Coloupop is made in the us, cruelty free and high quality. I love colourpop, it just blends so well even though it is a lower priced brand. Morphe is cheap Chinese junk and every time I try a low cost imported palette it is either absolutely terrible, chalky, or I have a reaction. Most of the palettes boxy sends are cheap imported ones. I did see on twitter that they are working on that, and will use our profiles eventually. I went and updated mine just in case that actually happens. Take my money Boxy, you got me for another few months. I just can’t quit you even though I sort of want to.